I don’t take a lot of selfies, but during my visit to Madame Tussauds in Orlando, Florida, I couldn’t resist. I walked away with my share of photos with celebrities, legends, sport icons, TV personalities and pop stars. Madame Tussauds is a world-famous museum filled with lifelike wax statues of famous people from history and popular culture. You’ll find Madame Tussauds on four continents. Orlando is one of seven locations in the United States. During my visit I learned a few tips and tricks to help you get the most out of your visit to Madame Tussauds wax museum. It probably goes without saying, but you can’t visit Madame Tussauds without bringing your camera. I’m an avid amateur photographer. If you’re serious about getting great photos at Madame Tussauds, I found that a DSLR camera can capture higher quality photos than what a smart phone can offer. Don’t worry if you are solo at Madame Tussauds – the staff are very friendly. I had one staff member offer to be my photographer when I was there on my own. Most importantly, be prepared to have some fun posing with your idols and sharing your photos on social media of you with Tom Hanks, Po (Kung Fu Panda) or Taylor Swift. Be sure to tag them on Twitter (@TussaudsOrlando) or Instagram (TussaudsOrlando) when you share your A-lister photo. My little photography tip: When you take photos, position the camera so it looks like the person is looking at the camera. If not, the photo looks a little “off” because your model is looking away. Don’t pay full price for your tickets to Madame Tussauds Orlando. There are several anytime discounts available. Buy online – You’ll save 10% and skip the ticket line if you buy online at www.madametussauds.com before your visit. Combination Ticket – Save up to $33 when you bundle Madame Tussauds with the Orlando Eye and SEA LIFE Aquarium. All 3 are located at I-Drive 360. Get details at www.officialorlandoeye.com. Go Orlando Card – Madame Tussauds is one of 30+ popular attractions included on the Go Orlando Card. Other attractions include the Orlando Eye, SEA LIFE Aquarium, WonderWorks and LEGOLAND Florida. Learn how you can save up to 55% at www.smartdestinations.com. You can do Madame Tussauds in 1-2 hours, so bundling it with other fun attractions nearby is a good way to make the most of both your time and your money. Madame Tussauds updates the figures as pop culture trends change. Some of the figures from my photos may change, but the sections will likely remain the same. I won’t share photos of all the wax figures in the museum – though I likely have photos of every single one. It’s fun to be a little surprised when you find your favorite celebrities. Here’s a general breakdown to give you a sense of what you’ll find at Madame Tussauds Orlando. When you first enter the museum, a photographer will ask you to pose for a photo. The green-screened photos will be available for you near the end of your tour. If you aren’t interested in having the group photo taken, you can decline. The first section of the tour is based on historical figures, starting with early explorers to America and wrapping up with the current president of the United States. Being the space nerd I am, the figure of Neil Armstrong was a must-capture. But I will note, Neil never took his helmet off on the moon to pose for a photo. That would’ve been deadly. Haha! The world is full of geniuses, and Madame Tussauds has hand-picked some amazing figures to display. They are in their elements, ranging from Walt Disney in his animation studio to Steve Jobs surrounded surrounded by binary codes. You can’t help but feel a little smarter when you hang out with some of the smartest people and creative minds that have ever lived. Are you a fan of the Denver Broncos? Maybe Tiger Woods is your favorite golf legend? Maybe take a step back in time to see boxer Muhammad Ali. The sports area covers a whole range of sports icons. 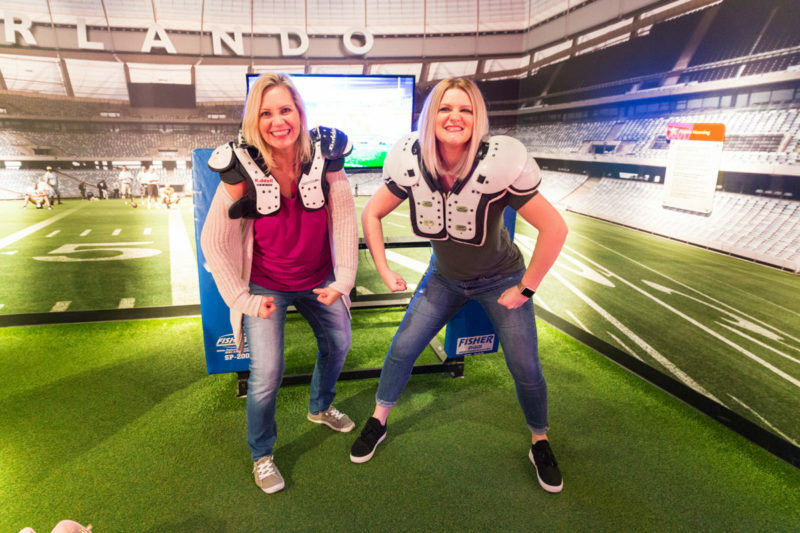 If football is your thing, then put on the shoulder pads and try out the interactive TV screen and tackling practice equipment. Otherwise, pose next to your favorite sports figures so you can show your friends that you’ve hung out with your favorite icon. Just because you’ve never been to a Taylor Swift concert, doesn’t mean you can’t grab a selfie with her. You can even pull in a guitar for your photo. Did you know she was so tall? Many of the pop stars throughout this section of the tour have props nearby. Elvis has a wig, cape, sunglasses, microphone and more. So keep an eye out for the props that can help you get perfect photos with your favorite pop stars and musicians. Have you ever wanted to be interviewed by Jimmy Fallon on the Tonight Show? Maybe you’ve dreamed of chatting with Oprah Winfrey. Here’s your chance to grab a photo on the set with some of your favorite television personalities, including my buddy Sheldon from The Big Bang Theory. Bazinga! The next section welcomes you to the world of Steven Spielberg and the movie sets and actors that are classic films. Like Breakfast at Tiffany’s, Kung Fu Panda, E.T. and Jurassic Park, to name a few. Keep an eye out for props you can wear – like a fur shawl for Aubrey Hepburn, or the famous red hoodie for a flight with an Extra Terrestrial. Before moving on to the next section, don’t miss your chance to pose for a photo at the goal of world-famous Brazilian football (soccer) star Neymar. As your tour comes to a close, join your favorite actors and actresses in a black-tie event. It’s the perfect place to grab a selfie with your favorite actors. Maybe you adore Johnny Depp, or Leonardo DiCaprio. Or maybe it’s Anne Hathaway or Jennifer Aniston. And you can’t forget Ryan Gosling. Tom Hanks is likely my all-time favorite actor, for movies like Apollo 13 and Sully. So grabbing a quick selfie with him (or his wax figure at least) was a great way to wrap up my tour of Madame Tussauds Orlando. Your tour officially concludes in the gift shop, where you can see the photo you took at the beginning of the tour. Where: 8401 International Drive, Orlando, Florida. Madame Tussauds is located in the I-Drive 360 Complex, right next to the Coca-Cola Orlando Eye – you can’t miss it. When: The museum is open year-round, but hours may vary. Generally, it’s open 10 a.m. to 10 p.m., but stays open an hour later on weekends. How Much: An adult ticket is currently $27.50 at the door. Child tickets are a little less. You can add-on a wax cast of your own hand for $15. I recommend that you buy online or combine with other Orlando attractions to save money on admission. How Long: One hour or more. Amenities: The gift shop is part of the museum tour, but the restrooms are part of the I-Drive 360 Complex.